I thought I’d start a new regular feature here on Candy Addict – every Friday I will post a link to a free web-based (Flash/Java) game whose theme is candy. It’ll give you something to do on Friday while you’re waiting for 5PM to arrive. Most candy sites have webgames on them, so I should be able to do this indefinitely. I will only post games that I have played and like. No duds. So, what better site to start off with than a game from Candy Stand – one of the oldest candy sites with games. 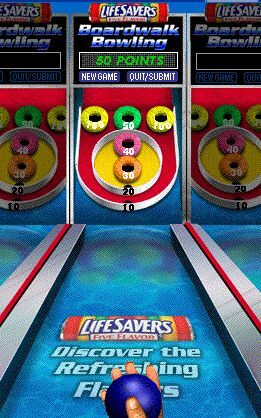 Today’s game is Life Savers Skee Ball (they call it Boardwalk Bowling, but they aren’t fooling anyone). is it just me or does it look like it could double as Froot Loops Skee ball too? Anyway, it’s a fun little game – and it has some really good sound effects. Post your high score in the comments! My high score is 520. You say “No duds.” What about Milk Duds? Har har. RESPONSE: Prepare to waste your whole day: candy mini-golf.